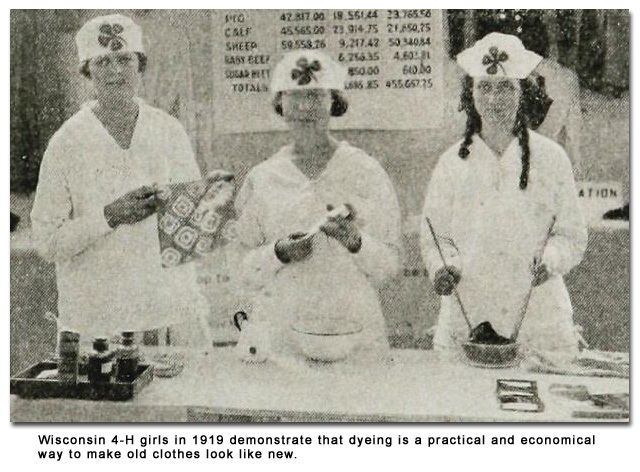 Clothing and fashion projects have been a part of practically all of 4-H history. From the early 4-H uniforms for boys and girls to the Fashion revues that are still common today, thousands of 4-H members learned skills in sewing and fashion design and proudly wore the 4-H name and emblem. The first story in the November 1919 edition of Boys’ and Girls’ Farm Leader tells of a team of 4-H girls from Wisconsin. Through competitions with sewing demonstration teams from other states, they had been selected to present their demonstration at the interstate fair in Sioux City, Iowa. Their demonstration showed how dyeing fabric is a practical and economical way to make old clothes look new. Dyeing! Dyeing! Everybody’s dyeing now! Dyeing! Dyeing! We are going to show you how. Dyeing! Dying! Everybody’s dyeing now! An article in the November-December, 1938 issue of National 4-H News heralds the awards to be given in the wool dress class at National 4-H Congress. It was the second year for this award category sponsored by the Associated Wool Industries. Two sterling silver trays would be awarded to the best wool school outfits, and two for the best tailored or semi-tailored wool outfits. In addition, $4.00 cash awards would be presented for each exhibit entered, with additional money awarded for blue and red ribbon outfits. Are there members of your 4-H club in the sewing project? Ask them to share what they’ve done. Consider how you can add some 4-H History to your county or state Fashion Revue or other clothing activities. In the “Hands-On History” section of the 4-H History website you’ll find ideas about presenting a 4-H History Fashion Show.